Every year around this time in the Berkshires, it seems like spring may have sprung. Even though it was 60 degrees out last week, we’re now fully back to winter, so we will continue our winter cleaning tips and suggestions. Our family here at S&S Janitorial Services have collected a list of ways to help you clear the clutter out of last year! Tips and suggestions that will keep you ahead of your cleaning routines. We’re here to help make Spring-cleaning a bit easier, especially when mother nature decides to tease us with warmer weather, only to bury us with snow the next day. We may have mentioned some of these same tips in the past, but as a professional cleaning company, we see these topics come up often. 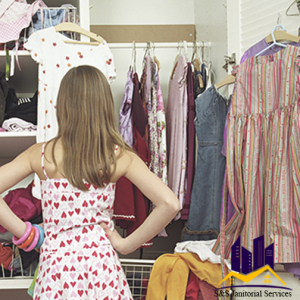 First, it’s time to clean out those closets! If you want to eliminate clutter, this is an easy step. Organize your clothing and decide what is a keeper, and what to give away. Not only will this help you, but donating clothing that doesn’t fit you, or that you don’t wear, will help the community. The best way to tell if you can give away that favorite sweater or coat is time – if you haven’t worn it in two years, it’s a giveaway. The keepers? Wash, mend, or send them to the dry cleaners. Next, pair up your mittens and gloves, and stack them neatly where they can be easily found. Single ones can be thrown out, or mismatched to similar singles. Just be sure that you actually use the singles, and don’t just hang on to them “just in case”. Our third tip is to clean any boots and winter shoes thoroughly, and spray with a protective solution to keep them ready for the next year. If they don’t fit, or you have not worn them in two winters, donate them. If you have a few pairs that need it and you have to keep; polish and clean shoes. Put them where you can readily find them, and keep them organized. The end of the year means taxes, and taxes most often means paperwork. Get your tax papers together now, if you start early, there will be plenty of time to go after missing receipts and add up deductions. If you have everything that you need, you can send your return to your accountant earlier (fi you use one) and get your refund faster. When this is done, you can avoid any last-minute roadblocks, and this will clean up some of the office clutter. You may even find that you can hire professional cleaners to assist you with some of the chores you really don’t want to do your self! 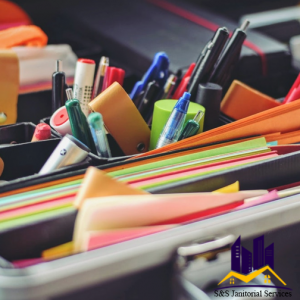 If you do a lot of work at home or make your living there, inevitably piles of papers, books and files can be a major eyesore. Now is the time to go through them systematically. File what needs filing, and recycle what doesn’t. If you’re not sure of something, ask yourself: Do I need it? Will I need it? Is there a better place for it? While you’re at it, do the same with your computer and laptop. Delete old files, empty the trash, store files you want to save on disks or a hard drive, organize your desktops. If you really want to deep clean your keyboard, take a look here. Taking this time now will put the finishing touches on a clean and organized work space. You’ll notice a clear difference in the way you feel, too, as studies have found a connection between stress and office clutter. If your dishes, silverware, pots, and pans tend to end up in a jumble, perhaps you have too many. Consider a more convenient storage system for frequently used pans, such as a hanging rack (or drawer) near where they’re used. 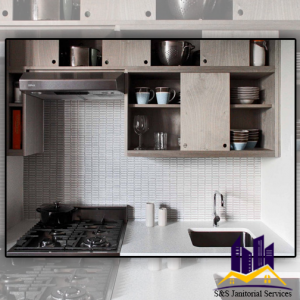 Pans that are used less frequently can be stored further away, or even in another room. The same can be said for dishes, or dinnerware that is saved for special occasions. You don’t need your holiday platter taking up space with your daily dishware! Go through your spices and throw away any that are expired. Add to those the containers that have just a teeny bit left in the bottom. A good trick is to add a note to the label of the date you bought them, and then after six months, which is when most dried spices lose their oomph. Return them to the rack in alphabetical order, making retrieval much easier. The Clutter is almost gone – You CAN do it! Pull all those cans and boxes of food out of cupboards and reorganize them. Some things get shoved to the back over time, and you end up with multiples. Who needs three cans of baby beets? If it’s still good but you really are never going to eat it, give to the food bank. If you need help, remember, we are always just a call or email away. We can provide free estimates on all of your cleaning needs, from entire office buildings to single rooms in your home. Keep coming back for our cleaning tips and suggestions for home and work!